From the moment your child entered this world, you have held a thousand hopes and dreams for him or her. It’s good to want good things for your child, and it’s good that you want the best life possible for your child. It shows that you are a caring parent. 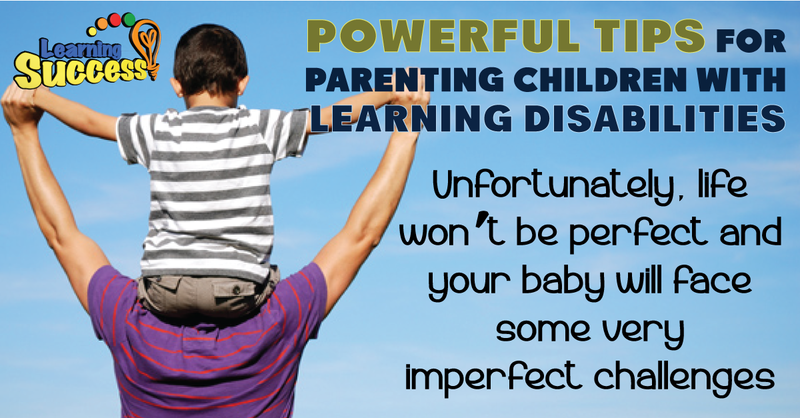 Unfortunately, life won’t be perfect, and your baby will face some very imperfect challenges. A learning disability is one of those challenges that every parent would sacrifice to no end to prevent. But perfect parenting doesn’t prevent learning differences. There are stages to a parent realizing there might be a problem, and as they occur, parents will go through a process of grieving the perfect academic dreams they once held for their child. In most homes, as a baby reaches his or her first major milestones, the parents feel elated. Some come early; some come late. Few parents worry (or should worry) about those initial late milestones, as they quickly come to find that babies don’t grow in factory molds. In the years before entering formal education, a parent might notice a few things different about their child. For example, maybe their child struggles to recognize how many items are in a group, even when the group is fewer than three. Counting hasn’t yet “clicked” for their child. Or maybe their child is still speaking in one or two word phrases. They might ask a professional’s opinion, or they may choose to wait it out, figuring that the child is still young and has time to catch up. Even when they seek out a professional, most parents feel little worry at this stage, because even if there’s a slight difference between how their child is developing and others, it is not yet thrown in their face. It takes very little time, once the child enters a formal school setting, for both teachers and the student to start recognizing the difference however. The child simply is not keeping up with his or her classmates in a particular area, and his or her teacher is calling home about it. The child also may develop a whole range of behaviors and emotions in reaction to his/her perceived poor learning. Avoidance, anger, frustration, and feelings of being “stupid” are all normal in the undiagnosed child with a learning disability. The problem is too many parents get stuck here for one reason or another. Maybe your child doesn’t qualify for school testing yet (I once taught in a school district that required the student two fail two grades before they’d even consider testing for a disability). Maybe you’re still convinced that a little more homework help or time or better incentives will fix the problem for your child. I encourage you to read up on the 5 stages of loss as you face the possibility of a learning disability in your child. It’s important to recognize that you will have to grieve, at some point or another, the very real loss of a dream. No matter where you are in your diagnosis (and grief) journey, take a look at the symptoms of several of the most common learning disorders. You can check them out here. Does one particular cluster of symptoms fit? Does your child appear to have one of the common learning disabilities? If going through these symptoms, you continue to suspect there might be a learning disability, don’t deny it. Your child needs you right now. The good news is, when you get to the point of acceptance, there will be abundant resources to help you. Your child doesn’t have to “live with” a learning disability, but the learning disability won’t simply go away by more practice. You will have to address the areas where your child has underdeveloped skills. We can help you with that. The Learning Success System is specifically designed to build up the building blocks of learning. Get it here.